Quayside Apartment is ideally situated on the waterfront of Portree Harbour, one of the most photographed locations in Scotland. 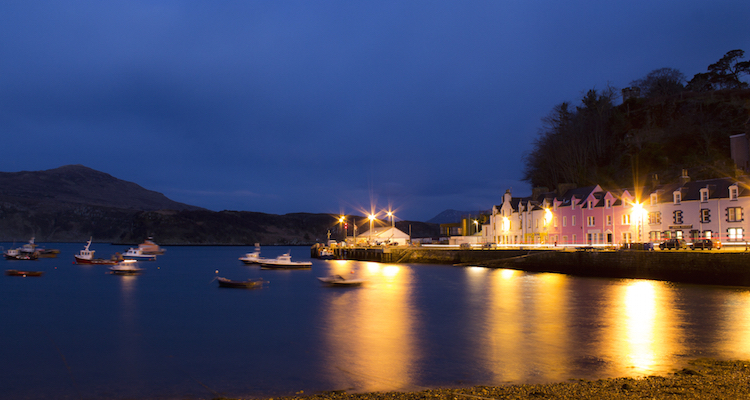 Portree Harbour is a bustling and busy place and you can sit in the windows and watch the fishing boats come and go and watch the fisherman bring in their catch of langoustines, crabs and lobsters. Come night time, the Harbour area is tranquil and romantic and it’s lovely to take a wee stroll along the Thomas Telford pier before bedtime. With Café Arriba serving all day breakfasts, coffees and a great choice of vegetarian and meat dishes, Seabreezes Portree’s most popular seafood restaurant right next door, you don’t need to go far should the weather not be favourable. You can still have a great day without leaving the harbour by taking one of the great boat trips that leave from just along the pier, on the Stardust or Brigadoon boat trips. From the Skye bridge take the A87 to Portree. Once in Portree follow the signs for Staffin avoiding the town centre. The road to the harbour takes a sharp right down a steep hill, continue to almost the end of the harbour where you will see the entrance to Quayside apartment located in between two Blytheswood Charity Shops.